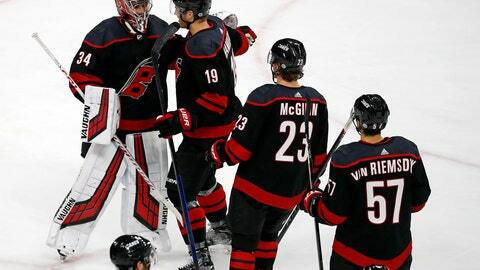 RALEIGH, N.C. (AP) — The Carolina Hurricanes are bringing the Lambeau Leap to their hockey rink. Their post-victory parties have gone viral : After each win on home ice, they’ve skated en masse down the ice and jumped into the glass. Consider it the latest sign that this isn’t the same team that has missed the playoffs an NHL-worst nine straight years. They call it the “Storm Surge,” and they’ve already done it twice to rave reviews from the fans who stuck around after the final horn. It debuted following Carolina’s 8-5 victory over the New York Rangers on Sunday night. After the buzzer sounded, the team lined up along one blue line and clapped their hands over their heads while DJ Khaled’s “All I Do is Win” played over the arena’s sound system. “Once he mentioned it, everyone was pretty excited and ready to run with it,” Martinook said. They know the celebration needs some fine tuning, and the best way to get it right it is by continuing to win — and to have a good reason to do it again. “I think we’ve got to get our tempo better and in sync,” rookie forward Warren Foegele deadpanned. They’re only a week in, but they entered Wednesday night’s games with an Eastern Conference-best seven points. Their 3-0-1 record is the franchise’s best since it relocated from Hartford to North Carolina in 1997, and the last time they opened a season by earning points in four straight games was in 1994 — when they started 4-0-1 and were still known as the Whalers. During their current three-game winning streak, they’ve outscored their opponents by a combined 16-9. For a team with a young core — key players Sebastian Aho, Martin Necas and Andrei Svechnikov were all born after the Whalers skated for the final time in Hartford — they’re determined to keep the focus on having fun and not on the pressure of trying to snap the NHL’s longest postseason drought.